Firstly, an apology or two. I imagine that several of you were expecting a fairly immediate report from Salute 2009 over the weekend. That would have happened if it weren’t for the onset of a nasty little throat infection. Also, the Twitter experiment from Salute didn’t quite go as anticipated. To be honest, in many ways the experiment worked – the technology was fine, the updates appeared in a timely fashion and it was easy enough to set up. The fatal flaw that I failed to foresee was that I’d actually be too interested in what I was seeing and doing to remember to tweet. I think things finally went silent just before lunchtime when we’d made arrangements to meet up with Bill Gaskin. So, in a way, that’s actually a glowing endorsement of this year’s Salute. The Victrix boxes seem to have a wider variety of poses. Good if you want to do a diorama but a pain if you’re constructing wargames units. The latter is where the Perry marching French and firing line British boxes score – you only need one box to do a unit (well, and a couple of blisters of metal figures if you want to add more officers or casualties etc). The Victrix faces are more charicatures than the Perry ones. That’ll suit some people but not others. You pay your money, you take your choice! Specifically for the French: the Victrix are in pre-Bardin uniforms and the Perrys are in Bardin uniforms. Specifically for the British: Victrix do different boxes for the Peninsular and One Hundred Days campaigns while the Perrys have designed one box to cope with both variants. Both manufacturers include plenty of spare heads. So if you’re into conversions, there’s hours of fun to be had! I’ve come away from Salute with a box of the Perry French plastics. Not because I’m about to start painting up French units (too much to do with Prussians and Saxons already) but rather because I intend nefarious butchery using elements of the box. These Perry French are in many ways an improvement on their metal French. I suspect that the time and effort required to create the “three-up” masters has lead Alan and Michael to take their time to get things right. I’ve always felt that many of the metal packs seemed a bit rushed. The proportions of the figures are superb and size-wise and style-wise they’re going to be an excellent fit with the imminent Calpe Saxons. Indeed, we spent a lot of time with Alan Perry at his Quatre Bras demo game playing “spot the plastic unit”. There are some slight differences on the right arms of some figures but the only real give-away is that the plastic bayonets are shorter and finer than on the metal figures. The heads and shakos on the Perry plastics are almost indentical in size to the ones on the Calpe Saxons. So, with judicious choice and careful cutting, there’s great conversion potential to expand the variety of the Calpe figures to create truly unique battalions. I’ll have to be careful though – French-style pokalems weren’t worn by the Saxons. That still leaves plenty of covered shako, bareheaded and damaged shako options as well as drums and backpacks to strew about on bases. The lone officer in the box (pity there aren’t more) wears a surtout and that gives me an ideal prototype on which to practice decapitation and to trial potential colours for the distinctive light blue surtouts worn by Saxon officers. It’ll also give me the opportunity to demonstrate a painting technique for von Peter’s young ADC Simon. He’s not keen on painting the piping on his French and got relentlessly teased by his father and I. It even got to the stage where both Peter F. and Alan Perry joined in to insist that if they’d taken the trouble to scupt it on to the figures, the least he could do would be to attempt to paint it! A young gamer can’t get advice from any better sources, don’t you think? And that’s an ideal moment to move on to the Napoleonic demo games. One of the two big 28mm draws was the Perrys’ Quatre Bras game which served as meeting point, gossiping area with Alan Perry and general eye-candy oggling opportunity. According the Alan, there were about 20 battalions on each side and the cuiraissiers never even made it on to the table! Seeing games like this and having the memory of them is what keeps me going with the paintbrush during those long evenings. The terrain was also a talking point with several boards sporting the twists and turns of a well-realised river through the middle of the battlefield. Finally, Alan was using a work-in-progress copy of the Black Powder rules due to be published later in the year by Warlord Games. So it looks like 1:20 ratio Napoleonics gamers will be spoilt for choice when it comes to rulesets. The other seductive 28mm Napoleonic game was Barry Hilton’s Peninsular demo/participation game. Although set in a different theatre, the parallels with the Perrys’ game were startling: more plastics (this time Victrix), more amazing terrrain (plus a nicely painted backdrop) and more rules to look at (this time being the quick-play rules Barry has written to accompany the Victrix boxes). Conversation with Barry revealed that these rules complement his bigger Republic to Empire rules rather than compete with them. Some ideas from the bigger ruleset have been used to create a “lite” quick and easy to play version. I somehow missed the 28mm retreat from Moscow game that was mentioned on the Salute website – perhaps it was a late withdrawl? If anybody knows it’s fate, I’d be interested to know. That left two 6mm games – each choosing the 1809 campaign as inspiration. One did Aspern-Essling and the other did Wagram. It left me wondering if each group knew of the other’s plans and if they’d swapped notes beforehand or on the day itself. From a distance, the 6mm games to have an appeal but I can’t bring myself to love this scale. I’m sure some people will regard this as heresy, but once you get to a scale this small, I don’t see the point in figure painting. Why not simply have coloured wooden blocks to represent the units and accept the fact that you’re playing a glorifed version of Kriegspiel? Apart from the games, there we several other items on my hitlist – some of which seemed doomed to failure. For example, I couldn’t find a single trader selling Sliflor grass tufts and I never located the chap who runs Dom’s Decals to quiz him about the art of making white decals. However, Peter F. and I did spend a while at the TA Miniatures stand. These are the people who the Perrys commission to make their artillery equipment for them nowadays. They certainly produce good work and the new Perry French 12-pounder is a fine example of their output. As ever, I took a couple of tours past the painting competition. Bill Gaskin had entered a lovely unit of Spanish lancers as well as some Polish musicians which he later told me he’d accidentally entered in the wrong category. Apart from that, I don’t think this year’s competition really got my juices going; quite possibly because every time I tried to look, there was a pushy crowd around the display cases. I didn’t care for that, I’m afraid. 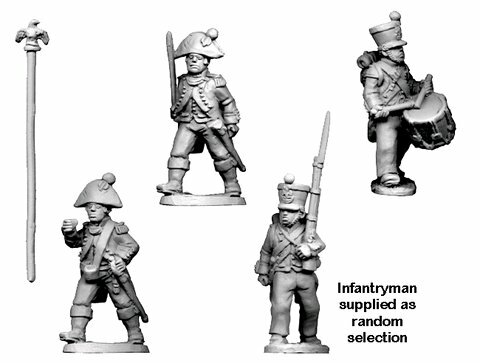 I also had a successful appointment with Offensive Miniatures to look at their new Napoleonic figures and discuss running a small competition in association with them here on BfK. So look out for details of that in the next week or two. Overall, then, despite some failed shopping opportunities, I rate this as the most enjoyable Salute since the move to Excel from Earl’s Court. There was more here for Napoleonic enthusiasts than there has been in a long time but the clincher for me is that I’ve been reminded that these big annual wargames shows as as much about the people as the games and traders. Where else could I have chatted and shared a cuppa with the likes of Peter F, Alan Perry, Barry Hilton, Bill Gaskin et al all in one day? Not to mention having the pleasure of seeing a couple of New Zealanders enjoy their first ever big wargames show? And I know plenty of other people I kind-of know were there on the day – it just wasn’t long enough to catch up with everybody! Prepare to be amazed, here is my confession: I’ve never painted a Perry Miniatures figure. I’ve acquired a few over the last couple of years and I’ve often thought about taking the clean-up tools and brushes to them but I’ve somehow never quite got round to it. Why? Well, I’m not too sure but I suspect its a combination of things. There’s typically quite a lot of clean up of flash and casting runners on Perry figs; the sculpting style makes for a challenging paint job and I’ve got plenty on my plate with Calpe Prussians. But, after returning from my Summer holidays, I’ve found it difficult to get motivated to start painting again so I reached the conclusion that a change is as good as a rest. But what I needed was a change that wasn’t going to commit me to too much of a distraction from the Kurmark landwehr. So, at Colours, I was tempted by a pack (just the one) of Perry French cuirassiers at rest. I’m not really sure what I’ve got in mind here. Eventually I’m going to need a single squadron of the 13th Cuirassiers for my 1813 OOB but there’s also the lure of just doing a single figure from the pack and maybe (if it turns out well) putting it into one of the SD Forum painting competitions. Then there’s my pipedream of experimenting with decals – believe me, cuirassiers have some awkward bits of painting that would be well suited to some decals like the grenade insignia on the shabraque (or saddlecloths) and the regimental numbers on the valise ends. And I’ve got some ongoing correspondence with a nice chap in Oregon that might be fruitful on that front. The other thing I’ve got to consider here is that the 13th Cuirassiers had an unusual distinctive facing colour for collars, cuffs and hounds tooth edging on the sheepskin saddle covers: in French, the colour is known as lie de vin which best translates as wine dregs. It’s a sort of purply-red winestain colour and some sources describe it as carmine. Now that leaves a lot of room for interpretation. The Foundry paint range has a triple of shades described as “wine stain red” (17A, 17B and 17C) which sound tempting and Valljo has a “carmine red” (908) in its range. It would be good to know if anybody’s got experience with these. So I don’t know where this’ll finish up (or even if it will finish at all) but it’ll be a bit of fun. Plus, there’s the bonus of some painting inspiration already knocking about to fuel the creative juices. Sascha Herm’s done a lovely vignette of charging Perry cuirassiers and Carl Robson painted a whole unit of the at rest figures recently. And, for me, that brings thoughts of Autumn evenings and picking up the paint brushes after a Summer of family activities. With that in mind I’ve resumed watching wargaming related happenings on the Web and preparing for a couple of forthcoming hobby-related outings. It’ll be interesting to see how these figures turn out in the flesh. I know plenty of people like sculptor Mark Simms’ Seven Years Wars range. Moving on, I’m in the throes some three-cornered post-holiday e-mail correspondence with Peter F. at Calpe Towers and Grahame at GMB Flags. With the forthcoming Calpe Saxons in mind, Grahame has been working on flags to match and he’s nearly finished the artwork. I’m hoping to persaude him to let me post some preview pictures of the flags here (but they’d obviously be fritzed in some way so naughty people can’t download and use them). And I’ll leave you with a couple of great examples of the 28mm Napoleonic figure painters art from recent threads on Steven Dean’s forum: check out this Perry French officer painted by Carl Robson (brother of Martin) and this is Sascha Herm’s first ever complete painted Napoleonic unit (hard to believe, isn’t it?). Enjoy the artistry.